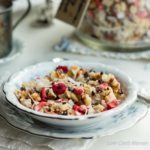 Macadamia nuts, coconut flakes, and cacao nibs collide with freeze dried strawberries and raspberries to create a great low carb granola breakfast sensation in this Macadamia Berry Blast Granola. Preheat oven to 325 and line a large sheet pan with parchment paper or foil. In a food processor or with a knife, chop the macadamia nuts into smaller pieces. Chop the flaked almonds until they resemble the size of oats. Place the macadamia nuts, almonds, cacao nibs and salt into a medium bowl and mix with the butter. Pour the Fiber Syrup over and mix thoroughly with a big spoon. Then, add the egg white, mixing again. Pour the granola onto the baking sheet and spread out. Bake for 15-25 minutes or just until it is fragrant and toasted on the bottom. Let it cool completely before adding the flaked coconut and freeze-dried fruit. Store in an air-tight container. Serves 8.